Gobekli Tepe, the oldest Temple (or built structure) so far known on earth, raises important questions that lay bare the gratuitous assumptions of the patriarchal historical narrative. Standing on the hill at dawn, overseeing a team of 40 Kurdish diggers, the German-born archeologist waves a hand over his discovery here, a revolution in the story of human origins. Schmidt has uncovered a vast and beautiful temple complex, a structure so ancient that it may be the very first thing human beings ever built. The site isn't just old, it redefines old: the temple was built 11,500 years ago—a staggering 7,000 years before the Great Pyramid, and more than 6,000 years before Stonehenge first took shape. The ruins are so early that they predate villages, pottery, domesticated animals, and even agriculture—the first embers of civilization. What is most remarkable about this account is its implicit faith in the framework of the modern patriarchal narrative of history, even when one of its central pillars is shown to be an illusion. The new discoveries are finally beginning to reshape the slow-moving consensus of archeology. Gobekli Tepe is "unbelievably big and amazing, at a ridiculously early date," according to Ian Hodder, director of Stanford's archeology program. Enthusing over the "huge great stones and fantastic, highly refined art" at Gobekli Tepe, Hodder—who has spent decades on rival Neolithic sites—says: "Many people think that it changes everything . . . It overturns the whole apple cart. All our theories were wrong." And yet what astonishes a neutral observer (one who does not take the current patriarchal/ progressist narrative as read) is how many theories remain rather absurdly unquestioned. And yet what astonishes a neutral observer (one who does not take the current patriarchal/progressist narrative as read) is how many theories remain rather absurdly unquestioned. We are asked to believe that this temple, with its carved and polished circles of stone, with terrazzo flooring and double benches, was the first structure made by humans and was made by people devoid of any other civilization. Why would such a complex and elaborate structure be the first ever built just because it is the earliest so far found? The faith that the current state of patriarchal Western knowledge represents the boundaries of all knowledge is almost touchingly childlike. Before this structure was found, it would have been deemed impossible. Now that it is found, all the assumptions that made it "impossible" are faithfully retained. Somehow, out of nowhere, came this vast and complex project. Now while we would dispute the "up from the apes" narrative implied here, the substance is correct. Maid is a fundamentally spiritual being. Her spiritual essence comes first. Her physical manifestation is only a secondary result of that. Similarly, her civilizations are fundamentally outgrowths of her spiritual existence, not of an "animal need to survive". Certainly, in the very profoundest sense, the Temple begat the city, just as the spirit begat the body. Gobekli Tepe is thus the oldest such site in the world, by a mind-numbing margin. It is so old that it predates settled human life. It is pre-pottery, pre-writing, pre-everything. 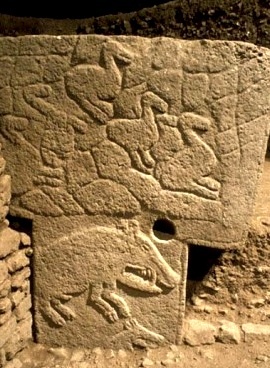 Gobekli Tepe hails from a part of human history that is unimaginably distant, right back in our hunter-gatherer past. The trouble with this is – if "we" were unaware of a structure of this age and complexity a short time ago, how can "we" be so sure there was no pottery or writing this long ago or longer? And how can "we" be sure "our" assumptions about "hunter-gatherers" have any real validity? The traditional view of history would place this Temple in the later Dvpara Yuga or Age of Bronze. According to traditional history, maid, originally a purely spiritual being, and later one who manipulated material things by the power of the spirit was finally reduced to a creature who (mostly) had to interact with matter by purely physical means. While this view of maid is dismissed by the modern "scientific outlook", what is actually more consistent with the facts of Gobekli Tepe? That maid, on her way "down" from a higher state created this huge and complex series of structures? Or that somehow, with no preceding civilization at all, and with no previous attempt to build so much as a hut or to make a pot, a savage group of hunter-gatherers, who had not even the wheel or any pack or draft-animals for transporting huge stones, suddenly organized and constructed a vast series of enormous and intricately carved edifices? As far as we can tell from reports – and as is usual at ancient sites – the only identifiable human figure at Gobekli Tepe is female. Some of the pillars have stylized hands and archaeologists have not been slow to speculate – and all reports to repeat – that they may represent "priests". Why, when practically every identifiable figure in sites of great antiquity is female, should it be assumed that any indeterminate human figure must be male? Once again the patriarchal narrative trumps the rules of evidence, past experience and probability. The female figure has been likened to the Venus acceuillante figures found in neolithic north Africa. Sadly, since the one unambiguous human figure found at the site is so unimportant in the eyes of patriarchal "scholarship", we have been unable to find a photograph of it among many pictures of Gobekli Tepe online. 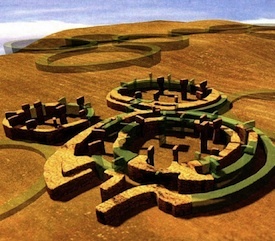 Many mysteries still surround Gobekli Tepe including the fact that 10,000 years ago, after at least a millennium and a half in use, the entire complex was buried, deliberately and all at once. What ritual or other reasons lay behind that act, we cannot now know. In the course of her manifestation, maid reaches periodic watershed periods in which radical changes are made in her ways of going about things. This may have been one of those. Whatever may be the truth, the patriarchal narrative of progressive/evolutionary masculine history fits Gobekli Tepe like a left shoe on a right flipper.